This application is designed for those who waver between choices or, even better, for those who want to know if something will or will not happen in future! Why don’t you try it? You just have to ask a question and, then, shake your iPhone: an answer will come to you, magically! Shake Future is designed with pre- set-up default answers in order to answer any question. But don’t you dare do something more? With Shake Future you can even create your own answer lists, modify them whenever you want to and add new ones. This is, then, the only application which will allow you a complete control on your answers! If you are with friends and you can’t decide who has to do the grocery or cook, you can make a new customized answer list, create it and shake your phone. You can use it also to choose the color of a new t-shirt, as well as the kind of hamburger you want. There’s even more! 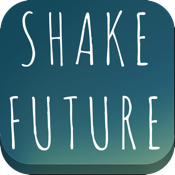 Shake Future combines a funny and fascinating graphics with the possibility to share your answer on Facebook and Twitter. This way, you can even comment you answers with friends. So, if you are in trouble and you don’t know what to choose, choose Shake Future and the answer will find you! WHY SHOULD YOU CHOOSE SHAKE FUTURE?